Destination to Visit :- Agra. 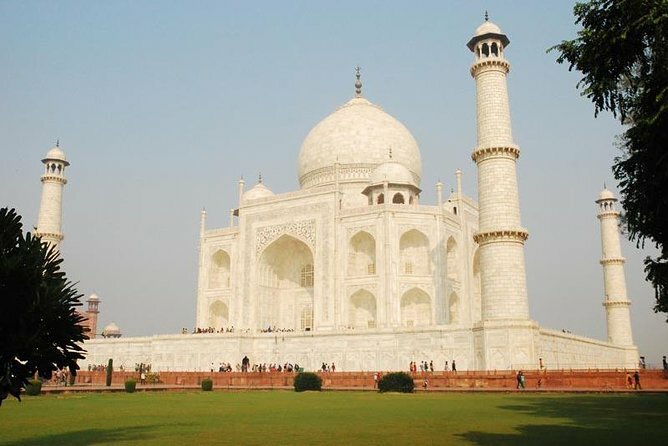 (Sunrise Taj Mahal Tour from Delhi by Car)• Duration and Starting Time:- Start from Delhiat 0230 Hrs. 1 Day Agra Trip • Pickup Point :- Airport / Hotel Delhi / Gurgaon / Noida • Attraction :- Taj Mahal, Agra Fort, It Mad ud-Daulah, Mehtab Bagh • End of The Trip :- Back to Airport / Hotel Delhi / Gurgaon.Agra is the most popular destination of India. This tour for people those coming in Delhi for short time and wanted to visit Taj Mahal. start from Delhi in morning and evening back to Delhi. Agra is house of three UNESCO’s world heritage site. It’s a must visit tourist destination. you will visit Taj Mahal, Agra fort, It Mad -ud Daulah,Taj Mahal from Mehtab Bagh and explore some local arts and handicrafts. Our driver will pick up you from your place and he will straight drive to Agra by Express way. Taj Mahal was built by Emperor Shah Jahan in the love of her wife mumtaz mahal. A beautiful building to visit explore for 02 hours long with tour guide and deep history of the monument. Agra Fort will be the next milestone. This gargantuan fort is built by Emperor Akbar, this is made up of red sandstones at one of either side of River Yamuna. Baby Taj is the tomb of Etmad-Ud-Daula (father-in-law of Jahangir), commissioned by Nur Jahan (wife of Jahangir). Have a lunch in Agra's famous five star hotel and taste some amazing delicacies food. Battery Van Ride at Taj Mahal for both Side.